Professor Mark Achtman has been announced as the winner of the highly-esteemed Pettenkofer Prize 2018 for his lifetime work on evolution of bacterial pathogens and their association with humans. 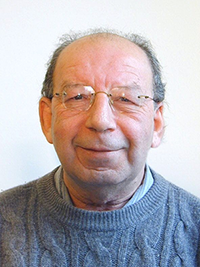 The Pettenkofer Prize is awarded every two years by the Max von Pettenkofer-Institute for Hygiene and Medical Microbiology in Munich in recognition of an individual who has made an outstanding contribution to research on pathogens. Professor Achtman’s recent work has, amongst other topics, focused on the age of bacterial pathogens, the genomic relationships among bacterial pathogens, and the population structure of salmonella. Find out more about his research here. Professor Achtman said: "I am thrilled to have won the Pettenkofer Prize during the bicentennial of his birth. Max von Pettenkofer emphasised the multiplicity of factors that were needed to result in clinical infection after infection with pathogenic microbes. Similar considerations are highly relevant to our modern attempts to reconstruct the detailed microevolutionary history of pathogenic bacteria." The award ceremony will be held on Friday 7 December and form part of the wider Pettenkofer Symposium at the Max von Pettenkofer-lnstitut.